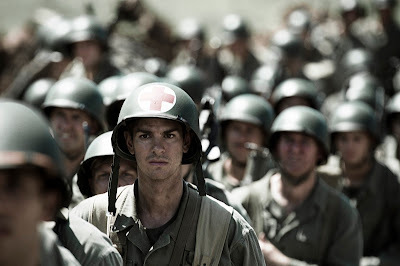 Mel Gibson’s throttling epic “Hacksaw Ridge” is based on the true story of Desmond Doss (Andrew Garfield), a stringent Seventh Day Adventist who, despite his unwavering pacifism, joined the U.S. Army in the last days of WWII as a combat medic. And in the no holds barred savagery that Gibson so often prefers as director, he seems intent on rendering all of Desmond’s life as some sort of pacifistic test. We see this straight away in the introduction of the adult Desmond, who is working in the church while his mom oversees the choir, only to rush outside and save the day when a stranger severs an artery working under his car. This sort of sudden violence seems to follow Desmond everywhere. Why even when he takes his future wife Dorothy (Teresa Palmer) out for a date, he almost gets hit by a passing car. It’s as if Gibson cannot go more than a couple minutes without in some way subjugating Desmond to inherent danger of the universe. This distaste for violence is tied to two defining events, one that opens the film, one seen later in flashback. First, young Desmond gets in a fight with his younger brother, nearly taking his life, chastised by his father, Tom (Hugo Weaving), a drunk and a lout, the same father that will later threaten his wife (Rachel Griffiths) which leads Desmond to protect his mother by putting a gun in dad’s face and threatening to pull the trigger. He doesn’t, and when he doesn’t, he finds his eyes drawn to a poster on the wall bearing The Ten Commandments, his eyes drifting toward “Thou Shalt Not Kill”, and Gibson lets the camera linger on that “Thou Shalt Not Kill” for a long time, burrowing its directive into Desmond. Adult Desmond carries his Bible with him everywhere, though we never really see him open that Bible, or even use it to minister, or even platitudinally quote from it, like The Sixth Commandment is all he really needs. Even at points in the concluding act at the titular battle, when he is made to ask What God Wants Of Him, it never quite comes off, because Gibson renders the character of Desmond as so uncomplicatedly holy. Garfield’s performance matches that lack of complication. He plays the part with an unremitting folksiness, almost seeming to be in some sort of down home haze in the early scenes in Virginia. When he meets Dorothy at the hospital where she works, the gruesome injuries surrounding him only partially seem to register, as he dissolves into a sudden of fog. Later, when he squires her to a movie, he ignores the movie to just sort of sit and stare at her instead. Honestly, it’s a little creepy. This seems like a set-up for when he enlists as a conscientious objector, which turns him into an outcast amongst the men in his unit, who bully him and beat him up in the hopes that he will quit. It seems like a set-up because we assume here, in the thick of boot camp, his faith will be tested. But it isn’t, not really, because he weathers all this, even an attempt to court martial him, with easygoing grace. Neither Garfield nor Gibson plant in Desmond even the slightest seed of doubt; he just rolls with it. There is a surprising lack of drama to these scenes, simply affirmation of what we already know will transpire. I kept hoping R. Lee Ermey of “Full Metal Jacket”, or even Viggo Mortensen of “G.I. Jane”* (*deep cut) would tag team in for Vince Vaughn’s drill sergeant to spice things up. The film’s enormous wrap-up, chronicling the Battle of Okinawa, is, as is Gibson’s modus operandi, an unrelenting assault of carnage. Not the 1940s WWII movies kind of carnage, where rows and rows of extras just fall down, but gore of a ferociously insistent kind that will likely precipitate the need to look away. This highly stylized violence makes sense as a contrast to Desmond’s nonviolence, yet Desmond’s nonviolence comes across oddly unmoved by so much blood and guts. As he goes about saving wounded soldier after wounded soldier, most American but even a few Japanese, this never feels like any sort of test for his beliefs. He feels like a predestined hero going through the dramatic motions, emblemized in the inevitable Christ imagery that Gibson just can’t help but render him in. But unlike Christ, Desmond is suffering and overcoming no crisis of faith; he is simply ascending to action movie sainthood.